The Vienna Institute for International Dialogue and Cooperation (VIDC) organised in cooperation with the Croatian Football Federation HNS and the fan organisation Football Supporters Europe (FSE) the first international conference on fan work "Together we are stronger!" on 13 and 14 April 2015 in Zagreb in the framework of the "Football Unites" project. Four internationally proven models of fan work were presented and discussed at the conference with the participants. Among them were the representatives of the clubs Dinamo Zagreb NK Marsonia, NK Vrbovec, of local NGOs working for diversity and anti-discrimination in sport and fans from the national team fan club Uvijek Vjerni. To kick off the NK Zagreb invited in the stadium restaurant for a dinner on Monday evening. In a pleasant atmosphere with delicious "cevapcici" and "pljeskavica" the fans of Dinamo Zagreb and the national team explained the reasons for the currently negative situation in Croatian football. The only bright spot seems to be the sporty successful national team, but they must play their next home match against Italy in Split behind closed doors because of racist incidents by some fans. Moreover, they fear to lose their ticket to France at the next negative incident on the stands. The international Fan Work Conference "Together we are stronger!" began the next day in the premises of the Hotel Laguna. 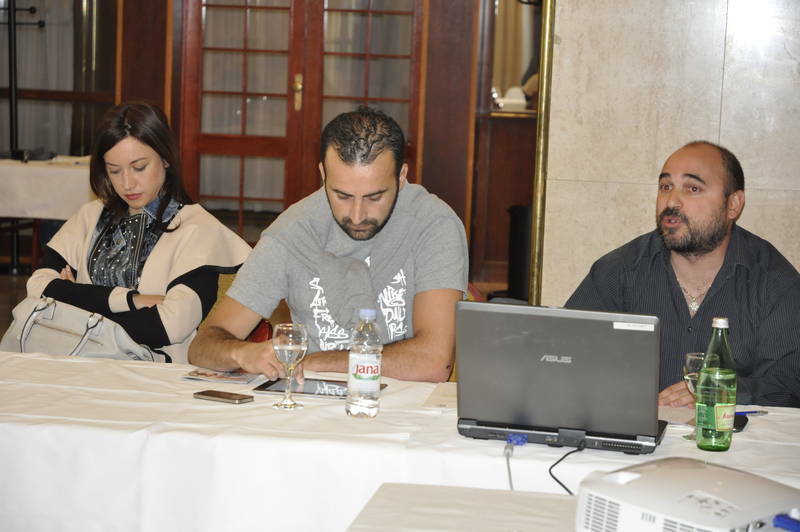 In addition to the 20 participants numerous TV stations and journalists had come from print and online media to attend the four workshops to learn about the work and methodology of Fans' Embassies, Supporters Liaison Officers work, fan activities against racism and socio-preventive fan work. After the opening speeches of Thomas Gassler (pro supporters - VIDC) and Marko Kuze (Dinamo Zagreb), Medhi Tazraret, head FSE Fans' Embassies France, presented the official UEFA Social Responsibility Project RESPECT FAN CULTURE – Fans' Embassies at the EURO 2016 in France, a fan service for the national team fans at Euro 2016. Tomislav Mileis (Uvijek Vjerni) outlined the areas of responsibility and the structure of the Croatian national team fan club Uvijek Vjerni. For discussion then came the role Uvijek Vjerni could take as Croatian Fans' Embassy in France and short-term strategies, how to minimise racism and discrimination on the stands at Croatian national team matches. Stuart Dykes of the fan organisation Supporters Direct (SD) explained the model of the Supporters Liaison Officers (SLOs) to promote the dialogue between fans and club representatives at club level. Although Marko Kuze the SLO of Dinamo Zagreb was present, there is still a lot of potential to develop the SLO service in Croatia and all agreed that the SLOs will play an important role in the future. The first step should be to install a national SLO coordinator at the Football Association. Pavel Klymenko from the FARE network informed about the UEFA monitoring system implemented by FARE at international matches. He also presented a number of international best practice examples of what organised fans can do in the fight against racism and discrimination. Thomas Gassler of pro supporters - VIDC told about the tasks of the Fan Work Coordination in Austria, which organises both the fan embassies in Austria and is also responsible for installing socio-preventive fan work projects at the clubs. At the end of the event, the next steps were discussed. The professionalisation of fan work in Croatia under international guidance appears to be a useful way for all concerned. The next day, two meetings with fans of Dinamo Zagreb, who could not attend the conference, could be spontaneously organised. Alexander Rakowitz, Balkan Alpe Adria Project: "This Fan Work Conference "Stronger Together!" in cooperation with the Croatian FA HNS, Dinamo Zagreb and FSE was the first step to bring the fans, the clubs and the national FA back together to prevent violence and discrimination in Croatian Football." Thomas Gassler, pro supporters - VIDC and Director FSE Fans' Embassies: "Even if the current situation between organised fan groups, clubs and the Football Association in Croatia is challenging, it is still our approach the fans not to see as THE problem but as an integral part of the solution. Far too often, football governing bodies only talk about fans but not with the fans. Our years of experience in professional fan work show us that the problems begin where the dialogue ends. The fan work conference "Together we are stronger!" in Zagreb is seen as a kick-off event. 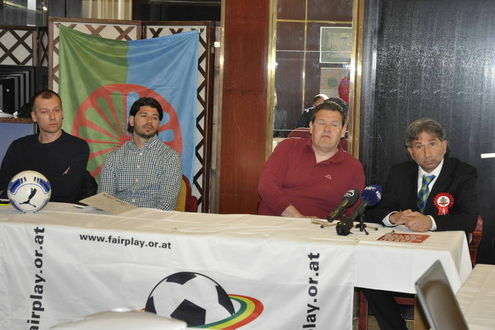 Organised fans and fan groups, clubs and the Football Association, in collaboration with international partners such as VIDC, FSE and SD should develop and implement a sustainable strategy for a positive fan culture and against racism, discrimination and violence in Croatian football." VIDC and its departement FairPlay is a partner of the Croatian Football Federation since 2013. This conference was part of a joint work programme with the CFF and organised in cooperation with the „Balkan Alpe Adria Project“ (BAAP). With support from UEFA international youth tournaments, stadium activities, workshops and conference are organised to overcome nationalism and exclusion in the framework of the work programme.